Steven Gerrard could change Rangers' fortunes despite his lack of managerial experience, believes his former Liverpool team-mate Charlie Adam. The former England captain, 37, has held talks with the Glasgow giants and is said to be keen on taking the job. "Stevie is a winner. He has been at the highest level," Adam, who started his career at Ibrox, told BBC Sportsound. Contrary to many observers, Stoke midfielder Adam believes Rangers would be "a great first job" for Gerrard, who has coached Liverpool's Under-18s since retiring from playing two years ago. "It is going to be a big one but I think he could be the one who could hopefully change the fortunes," said the former Scotland international, who played alongside Gerrard at Anfield. "From what I am hearing, he is keen on the job, and what it will come down to is what he has got available to spend in the summer, because it does need an overhaul of players. "Financially, Celtic can sell three or four players for £30-£40m in the summer and re-invest that and be strong again. So it is going to be a tough ask, but I think he is the one at the moment who could change it." Adam, 32, was at Rangers from 2003 to 2009 and admits it was "embarrassing" to watch the manner of their 5-0 defeat by Celtic, which saw their great rivals secure another title. But rather than be put off by their performance, Adam believes Gerrard "will relish the challenge" of taking on Celtic, and his former Liverpool boss, Brendan Rodgers. "The character he is, he will probably be thinking, 'I can be the one who can change it'. He is brave enough to come in and stamp his authority on it. "But you could put whoever you want in; it will come down to finances. That is the biggest problem Rangers are going to have over the next few years - trying to compete with Celtic financially. "It is important now that the board - or whoever is in charge of Rangers - brings the money to the table and they can spend it well. "It is not just buying players for a million quid. You have to spend £2m, £3m, £4m on players. 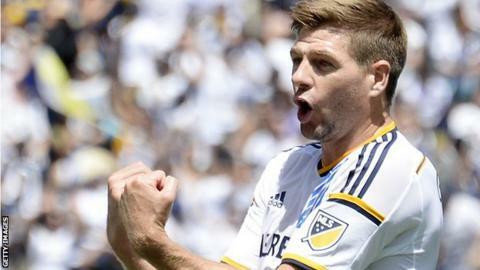 It is going to be a thankless task but at the moment, I think he [Gerrard] is the one who can do it. "He knows the game, he has been to a few Old Firm games, he knows players, would probably try to bring a lot of players up from England and improve Rangers. It is going to be tough but I would like to see it happen for him. "He is a leader. He expects a certain standard and if you are not at the standard he expects, it will be difficult for you as a player. "He won't take any messing, he will tell it as it is. I think that is what Rangers need. "I think too many players are not at the level to be playing for Rangers, and if he does get in there, he has to change that and try to get the right players in." Adam, who has only featured in 11 league games for Stoke this season as they battle relegation from the Premier League, admits he wouldn't be averse to a return to Rangers. "We are in a relegation battle at the moment," he added. "My future will be sorted in the summer, and we will see what happens. "I am never going to rule it out. It is the club I started at. They say 'never go back' but as a former player, it hurts to see Celtic dominating so much. "You never know what is around the corner in this game."